Book our San Antonio junk removal service today! 1-800-GOT-JUNK? is a leader in junk removal and trash removal in San Antonio and area. Book your appointment online and save $10. San Antonio's 1-800-GOT-JUNK is ready to help remove and dispose of your junk in San Antonio and its surrounding communities such as Bexar, Comal, Guadalupe, Helotes, Leon Valley, New Braunfels, Boerne and Bandera. We are a full-service junk removal company – call it rubbish removal, trash removal, hauling services, de-clutter help, or simply junk disposal – if you don't need it and it's taking up space, we can take it away for you. We even have same-day pick up service. It’s that simple. 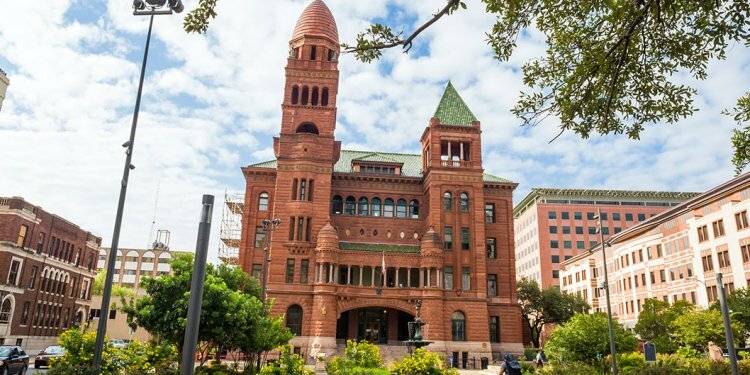 Why use us for junk disposal in San Antonio? Because we have a GSA number, we can service any government services agency. We’ve done junk removal for all the military bases for San Antonio, such as Randolph AFB, Lackland AFB, Fort Sam AFB, and Camp Bullis. At 1-800-GOT-JUNK?, we take anything non-hazardous that two people can lift. Whether it’s old fridges, tired ovens, broken microwaves, outdated computers, used mattresses, worn furniture to garden debris, construction waste and renovation debris, we’ll take it. We have even taken a coffin (no – nobody was in it!). If you don’t need it, we’ll get rid of it for you. We have both residential and commercial clients. We often help people who need a general clean up, people who are moving, people who are holding an estate sale, tearing down their old sheds, clearing out the garage, storage unit, or basement, or helping people move in to a new office. 1. Tell us when to come by, either by phone or by booking an appointment online. We know your time is valuable, so we give you a 2-hour arrival window, and will call you 15-20 minutes in advance to tell you when we’re about to arrive. 2. Show us the items you want us to take, and we’ll give you an upfront, all-inclusive junk removal price to take it away. Our pricing is strictly volume based. We don't charge you for dumping fees or labor; you are only charged for how much space your items fill in our junk truck. If you like our quote, we get to work picking up your garbage, removing your trash, and hauling away your junk. Of course, we clean up your space after we’re done so that you get it back in mint condition. Where does the junk go? We do our best to divert as much of your junk and trash from the landfill as possible. We recycle almost everything we get, and make sure it gets to the appropriate scrap yards in the area. For items that are still useful, we donate them to Goodwill, the Salvation Army, and The Children's Shelter Of San Antonio. Copyright © 2019 l junk-removal.biz. All rights reserved.